Last year was an awesome year for the blog. Currently we have over 32,000+ subscribers. We produced lot of high quality articles last year on Linux and open source. I also published the Nagios Core 3 ebook. I’m very excited for 2011 and I have tons of tutorials on Linux lined-up for this year. I appreciate all the support giving by the regular readers of the blog. You all have motivated me in more ways than you know. Wishing you a Wonderful Year,Where Dreams Become a Reality,Success Becomes Routine n Happiness a Habit Happy New Year 2011 ..
And thank you for all helpful articles. Will look forward to your 2011 blog posts. A very happy new year to you both! Happy New Year!! Kind regards to you and your family and many thanks for all the tutorials! Happy new year to you and your family. I found these articles more useful. So please keep posting.. Happy New Year to you and your ‘Doll’. And thank you for the many great tips and guidelines. Happy New Year and all the best to you and your familly. Happy New Year to you and your daughter. I’ve enjoyed reading your blog, as a fairly longterm Ubuntu user (since 2006), it’s very informative and helpful. Good fortune and good health in 2011. And you are, indeed, fortunate in having a such beautiful daughter!! Thanks for all the great info you’ve put out over the last year! Happy New Year to you, and what a beautiful daughter you have. bloom with knowledge and love…. on this new year and always….! Very Happy New Year and Happy Pongal to your crew……! Wish you and your cute daughter a very happy new year ! 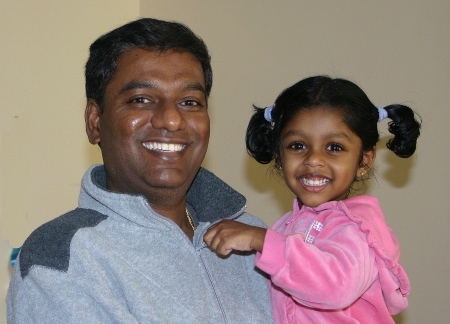 Happy New Year to you, Ramesh and your pretty daughter! Your blog is the best one online!! Keep blogging!!! wish you the same for you and your family, like you folks are the big inspiration to many, i love to see many more interesting topics / white papers this year. I wish you to become an iconic figure this year, for me you are my hero. Wishing u “””””Happy new Year”” to u and your family ………. Thanks for sharing all those tips with us. Hi Ramesh, Wish You Happy and Prosperous New Year.. Thanks for all the articles. Happy New Year to you and your daughter too! Best wishes for a Happy and a healthy New Year. You are a great guy and definitely a role model for your little princess. Thanks for sharing your expertise with the world! Happy New Year and best wishes for 2011 and beyond. Your daughter is beautiful. I can judge, as I am a grandfather, and I know beautiful grandchildren. Happy New Year to you and your family mate. You have rily broaden our skills in linux and I would like to wish TGS lots of success in this new year and may it overflow with knowledge. Great Blog! Great Photo! I only wish you created this when I first started learning about linux and open source (when i was 13 yrs old). I learned the hard way, books from libraries and BBSes. Happy Near Year to you and your family!! as many as your wishes! And thanks for sharing your knowledge. happy new year to you and your daughter! Happy new year too, I learned a lot from your website, and very appreciated for that. Have a great new year, hope all your dreams come true in this year…. A very happy new year from The Netherlands. Keep up the good works on TGS. I have learn many thiongs with you. Thank’s a lot for you availability. Happy new year to you and your daughter. Your help and advises are priceless. You really contribute to look Linux more comfortable for us, at least for me. Keep in that way. Thank you very much. I wish you a healthy 2011 year. Happy New year 2011 to both of you & TGS family. Thanks for managing such a good KB site. Yes,In the past year,You have done much for us, I wish you a good happy year in 2011 . Thanks a lot for your wishes and kind words. Your comments are a great motivation for me to keep publishing more articles. Where is the mom that goes along with your happiness. Please update the photo. I have been using Linux since Ubuntu Hoary H.
into the background and your blogs have helped very much. what i enter doesn’t work. oh well i just have to have a list handy to refer to.